Prof M Rahman, NUS Department of Mechanical Engineering giving a presentation on Large Format Machining in the launching event of Large Format Machining Lab (SIMTech-NUS Joint Lab). 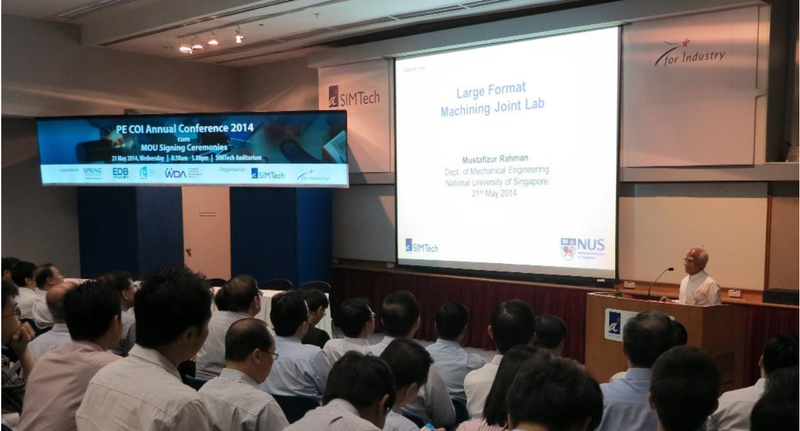 SIMTech-NUS Joint Lab on Large Format Machining will help Singapore gear up for high value-added manufacturing. Launched on 21st May 2014 at A*STAR’s Singapore Institute of Manufacturing Technology (SIMTech), the Large Format Machining lab is a collaborative effort by the SIMTech and the NUS Faculty of Engineering. With the growing demand for machining from the aerospace, oil and gas and medical devices industry, the Global Machine Tools and Cutting Tools Market report in 2013 by Frost & Sullivan revealed an annual market revenue growth of US$15.72 billion in 2012, and forecasts a compound annual growth rate (CAGR) of 6.2 percent over the next five years. The Joint Lab will tackle the challenges faced by the industry such as distortion, inaccuracy, high aspect ratio, and harsh working environments that can cause tool failures in the machining of large and complex components, mainly on difficult-to-machine alloys for various marine, oil & gas and aerospace applications. As such, the Joint Lab aims to be a leading research centre in large format machining science and technology, training the future workforce to support high value machining of large parts with complex surfaces, high precision thin-walled structures over large areas and machined features with extremely high aspect ratios. This lab focuses on the development of cutting-edge technologies and competencies enhancing the competencies of local precision manufacturing, maintenance, repair and overhaul companies. This will increase Singapore’s economic competitiveness through the localisation of high value manufacturing of large and complex parts. By webadminanonymous in Post on March 16, 2015 .